Low cost, 20,000 hour short throw presentation for conference rooms and classrooms. Physical attributes. The connector panel is on the rear of the S518WL. Air intake is from the left side, and hot air is exhausted from the right side of the chassis. 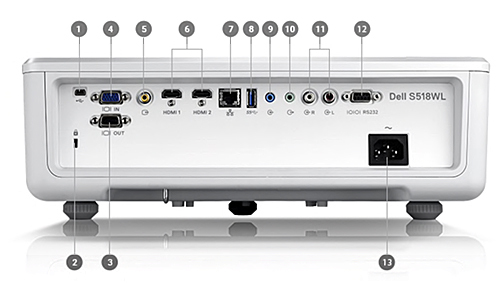 The power connector is at the lower right of the connector panel, and a keypad is located at the back left of the cover panel. ECO mode. ECO mode reduced brightness by about 23%, so for many viewing environments, you can take advantage of the lowered fan noise in Eco mode and still have a sufficiently bright image, especially in the 90" to 100" image size range. 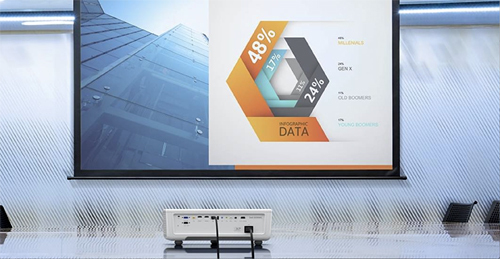 Brightness Uniformity.The S518WL delivered uniformity of about 80%, which is excellent for a short throw projector and solid performance for any projector. Excellent uniformity is a key for presentation projectors since hot spots and side/corner fading are particularly visible with spreadsheets, text docs, and solid color PowerPoint presentation graphics. Poor uniformity is less visible in video, although still undesirable. Throw Distance. Although it is rated for throw distances from 2'7" to 3'8" and corresponding image sizes of 70" and 100", our test unit focused nicely at up to 20% longer and shorter throw distances than specified. Diagonal images of up to 120" were sharp edge to edge, so if you want to push the image size a bit beyond maximum spec there should be no focus issue. Input Lag. The S518WL has an input lag of 33ms. Fan Noise. Fan noise is relatively low and is composed of medium frequencies that do not bother most spectators. Invoking Eco mode reduces fan noise to a whisper, so if the room's ambient light is low enough, you can reduce fan noise and possibly extend the already long life of the illumination system. Throw distance. The S518WL specs call for an image size of 70" to 100" diagonal images. Since there is no zoom lens, you determine the image size by moving the projector closer to or farther from the screen. This is not an ultra short throw projector by our classification, which normally has a throw ratio of 0.3 or less. The throw ratio of 0.52 means the throw distance from lens to screen for a 100" image will be 3'8". Focus.The focus ring is effective over the rated throw distance range, and even beyond those specifications. The image is sharp edge-to-edge throughout its intended image size range, and even about 20% more than the rated maximum throw distances. This means a 120" image remains as optically sharp as a 100" image, although with a resolution of 1280x800, a 100" image will look sharper and better integrated with complex data presentation material. At this writing the $1500 Dell S518WL is the lowest priced laser-based 1280x800 projector on the market. There are a handful of models that are ultra short throw that cost somewhat more, but one of the benefits of a slightly longer throw is better brightness uniformity, and at 80%, the S518WL is doing a very solid job. Our tests show that a 100" image diagonal is well lit even in rooms without shades drawn as long as the outside light is indirect. If you want to maintain a bright room with full lights one, you will want to limit image size to 80" or so to preserve enough contrast for audience satisfaction. Even though its resolution is 1280x800, the S518SL is a good video projector with nicely saturated color and good black levels in high contrast mode. Adjustments to brightness and contrast can be made to suit the ambient light level in the viewing environment. As a data projector, the S518WL does an excellent job with text down to 8 point even at maximum keystone correction settings. Complementing the visual performance are dual 10W speakers that are plenty loud enough for a medium-sized room. Though this is ample audio power for many conference and classrooms, there is an audio output should you need to use external speakers. The laser illumination system is rated for 20,000 hours of operation, so there is no need to budget for lamp replacements. A $1500 projector that delivers 20,000 hours is giving you a total operation cost of 7.5 cents an hour. Connect your S518WL to your network or use an optional wireless dongle, and your choice of input devices expands. You can choose from not only your PC or DVD player but also your tablet, phone, and other portable media devices. There is also a USB input that accepts memory sticks for PC-free presenting. 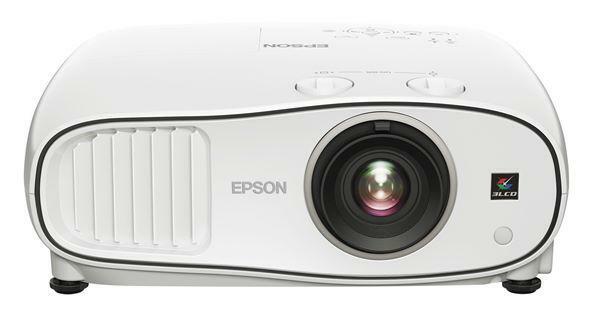 Unlike many short-throw projectors, the S518WL is 3D capable. Optional 3D glasses are required, but if viewing 3D content is a desired option, the S518WL does it. In the end, the essential story of the DELL S518WL is one of excellent value - more than sufficient lumen output for up to 100" screens in conference and classroom settings with ambient light, the convenience of short throw, solid brightness uniformity, PC-free presentation, 3D if you want it, and a 20,000 hour light engine, all for $1500. That is a hot deal by any measure in today's market.